Barnes & Noble is sure to win over some paperback-book readers with its All-New Nook. Its sunlight friendly 6-inch e-ink touchscreen display responds readily with a simple swipe to turn pages. The All-New Nook gets an unprecedented two months of battery life (or three weeks with Wi-Fi turned on). And it’s smaller and lighter than a paperback book—and most ebook readers for that matter, including the Kindle Wi-Fi—weighing just 7.5 ounces and measuring 6.5 x 5 x 0.47 inches. 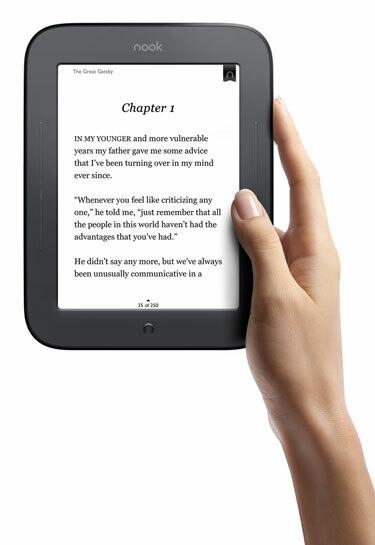 The All-New Nook is a pure reading device. There’s isn’t support for apps, like the Nook Color, or even audio books, like the original Nook or Amazon Kindle devices. And without the Kindle’s physical keyboard, it feels more book-like in your hand. There are four long buttons on the front that you can use to turn pages, if you don’t want to swipe. Barnes & Noble paid attention to hand feel, using a soft-touch, almost rubberized paint for a firm grip. There’s also an indentation in the back that nicely accommodates your fingers while holding the All-New Nook. The 6-inch e-ink touchscreen display is the latest technology, affording the same crisp contrast you’ll find on the Kindle devices. Barnes & Noble claims faster page turns and less flashing as you turn the page. Both did seem improved, but there’s was still noticeable flashing. In all, the All-New Nook is a nice addition to Barnes & Noble’s lineup. A single-purpose device that’s well executed certainly has a place. You can pre-order it for $139. The existing original Nook Wi-Fi and Nook 3G prices drop to $119 and $169 respectively while supplies last.